Sometimes the EmpireMinecraft servers run into issues, including crashing or extreme, long-lasting lag (meaning it's unbearable, and has been going on for more than a few minutes). The purpose of this thread is for reporting such issues to ensure we know about such issues, so please post such problems on this thread Only. Include full information of the problem with exact details of what is happening. Any exact wording or details that may help us diagnose the root cause. Please do not make any other threads about server problems, as they will simply be locked or deleted since they do nothing but add more spam to the forums. Also, please only post here if you genuinely think the servers are having problems, or are adding detail to an existing problem. Watch this thread and learn when the servers might be having issues, by clicking here. SkeleTin007, 607, We3_10AC and 13 others like this. Yeah, SMP6 is a dog atm. Anyone else? Lordess_Spartan, Vizsco, HannahEB and 3 others like this. SMP1 ping times are shooting up & down all the time, it can get pretty annoying. From what I know, it's been happening more than a few hours - and it's not just me. hannesvdwalt, Olaf_C and Ultimamaxx like this. 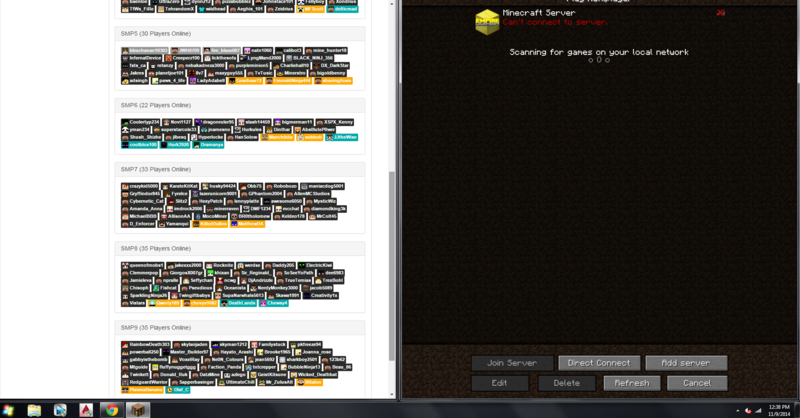 I realize its not a server problem but a forum problem. I couldn't find any other threads to post in so I'm gonna post here. Making a PM is EXTREMLY laggy and glitchy and the replies duplicate and so do the pm's. For example I accidentally sent 5 pm's to the same people with the same message. Only Pm's are affected by this lag though and not general forums which is weird. I don't know if this is the same problem as before, but the in-game lag is either still awful or awful again. It's been weeks or more since I've had a whole day of playability. It's like up to a 15 second delay before anything happens after i press a button (in-game) or input a command. Smp6 live map doesn't get load and I am lost and scared. Only the live maps of smp 5 and 6 have been dead for quite a while. Serious threat to those adventurers in the wilderness. The lag is bearable in town, but the wild is unplayable for me on smp1. I don't know if this is the same issue, but I'm very near giving up. It's been on and off something or other since the 1.8 compatibility update. Monsters freeze for long periods of time then move (and kill me) all at once in jerky movements. Commands have long delays. I can't even walk through my iron doors half the time because of delays and lag with the button. There's almost never a corresponding drop in fps or tps. Aikar messaged me weeks ago to explain what might have then been the problem then, but this has been on and off for way too long. Monsters freeze for long periods of time then move (and kill me) all at once in jerky movements. Commands have long delays. I can't even walk through my iron doors half the time because of delays and lag with the button. I've lost like my 10th set of OP diamond tools to lag and lava. Aikar messaged me weeks ago to explain what might have then been the problem then, but this has been on and off for way too long. It's working for me fine at the moment too, and then it won't be. And now I keep lagging out, and all my text shows up as much as 30 seconds late. I hopped onto a non-EMC server in the middle of it, and it was fine. I returned to EMC to find the lag waiting for me. It's not exclusive to smp1 or the wild. How do you get the list of the players like the left pane on your screen by the way? fishmeal and Hiko_Bellick like this. smp1 hit 12 tps just now. Edit: now it's at 2.8. Edit: I can stop editing now, but it's below 1. TheStickMan999, oidking, BrenRGerm and 1 other person like this. Uh I can't connect, I get netty every time. I can connect to other servers just fine.